Cut down on The Great Purse Search with this handy, rechargeable bag light. Even in your most organized bag, retrieving lip gloss feels like spelunking for a single penny. Make it a bright vision of order with this rechargeable, automatic light. The sleek square fits in any purse or tote and lights up at the touch or approach of a hand, turning frantic rummaging into game-changing illumination. The light switches off after a few moments to preserve the battery—just enough time to grab that mint, wallet, or phone. 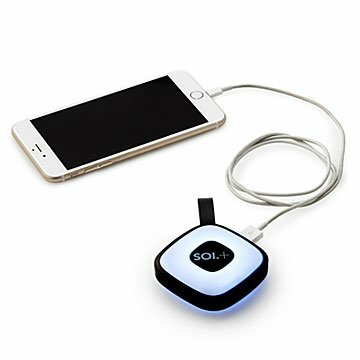 Speaking of phones, you can give yours a power boost (once you've found it) through the light's device charger port. It's one brilliant design that's not averse to sharing power. Designed by Christian Schech and Bastian Wetzel. Made in China. A power failure at a folk festival inspired designers Christian Schech and Bastian Wetzel to see the light. Watching women at the festival rummaging through their purses in the dark, the technically trained duo sought an engineered solution. Previous pocket flashlights were awkward and inconvenient to handle, so the designers' decided to develop a lightweight, conveniently sized handbag light that's portable and easy to use. The team was joined by designer Benedikt Lehnert, whose involvement shaped the design process that produced this illuminating design. I saw this listing and it was a surprise, the perfect solution to a problem that I had never realized could be fixed. The light is powerful, and not only does it help me find things in my large totes but also has been useful for traveling. It's been used as a nightlight for bathroom visits and also as a small flashlight. I haven't used the charger aspect of it yet, but I like that it's there - even if it is small. My friends are all envious, I wish I had discovered this earlier so I could have bought some for Christmas gifts. This product was appreciated by all the recipients. One used already to recharge phone while daughter underwent operation. Another, a pilot, took it with her as a backup battery for her phone when flying a plane without auto GPS. I used mine when a sudden windstorm knocked out power and I didn't have a flashlight handy. This light/charger can be used in so many situations. A thank you to the inventors! I would buy this high quality but affordable product again. Chose this as a gift for my friend who lives in another state. She's very practical and travels for work, so thought this would be a great gift. Small, not bulky, easy to use, practical!